As I’m sure you already know, Mechanical Ventilation is definitely one of the most difficult subjects and courses that you will take in Respiratory Therapy school. It’s the course that most student struggle with. With that being said, it’s arguably the most important as well. Knowing the ins and outs of Mechanical Ventilation is crucial for anyone who wants to be a successful Respiratory Therapist. This is why it’s so important to truly learn and understand the concepts now, as a student, so that they will carry over in every part of your career. To help with that, we put together this Mechanical Ventilation final exam study guide that has some of the best practice questions that will help you learn everything you need to know in order to ace your exams in school and pass the TMC Exam whenever that time comes. So are you ready to get started? Good, let’s dive in. 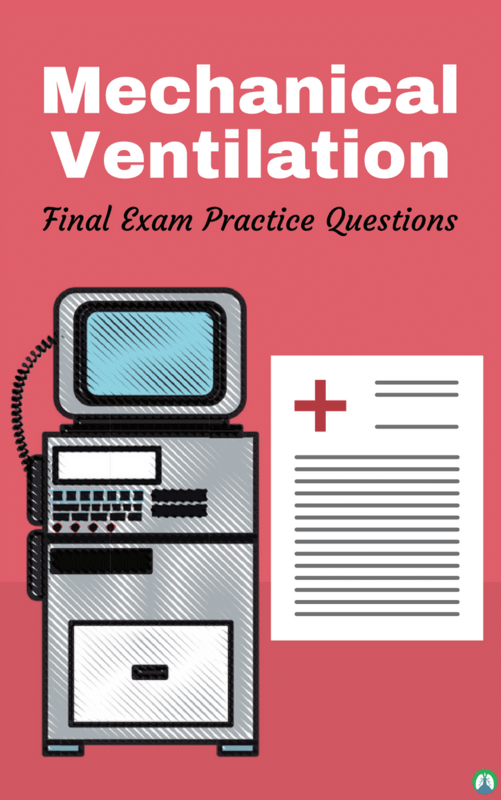 Below you can find all of the practice questions that can help you prepare for your Mechanical Ventilation Final Exam. If you want the correct answers as well, you can get them (free) through the following link by Clicking Here. 1. Which of the following is an indicator of weaning failure? 3. Terminal weaning is defined as _______________ of mechanical ventilation that results in the ______________ of a patient. 6. If pulse oximetry is used to monitor a patient’s oxygenation status, the pulse oximetry O2 saturation (SpO2) should be kept in the mid-80s for allowance of machine inaccuracies. 7. The ____ is measured by dividing the patient’s tidal volume (measured at the airway opening) by the difference in the plateau pressure and the PEEP. 8. Patients who fail the SBT often do so within the first 10 minutes of the trial. 9. ____ is an indicator of weaning failure. 11. ____ remains an effective tool in altering the degree of partial ventilatory support during continuous mechanical ventilation. 12. Generally accepted ventilatory weaning criteria includes a ____. 13. For a successful weaning outcome, ____. B. The P(A-a)O2 should be < 450 mm Hg while on 100% O2. A. Likelihood of weaning success. C. Readiness of a patient to begin the weaning trial. 15. The ____ is used to estimate how much pulmonary perfusion is wasted. 16. Which of the following patient conditions is the least important consideration prior to weaning a patient from mechanical ventilation? 17. The blood gases and related parameters of a patient are as follows: pH = 7.43, PaCO2 = 40 mm Hg, PaO2 = 80 mm Hg, PECO2 = 30 mm Hg. What portion of the tidal volume is considered wasted (deadspace) ventilation? 18. A patient has the following oxygen content measurements: CcO2 = 20 vol%, CaO2 = 18 vol%, CvO2 = 13 vol%. The calculated QS/QT is about _________ and it reflects ___________ shunting. 19. ____ is defined as an absence of ventilatory support 48 hours following an extubation. A. The detailed process of weaning. B. The evaluation of weaning outcomes. C. The patient condition in which weaning may be attempted. 21. Automatic tube compensation (ATC) allows the patient to have a breathing pattern as if breathing spontaneously without an artificial airway. 22. When the RSBI or f/VT ratio becomes greater than 100 breaths/min/L, it correlates with weaning failure. 23. ____ is a clinical condition that decreases static compliance. 24. ____ is a clinical condition that decreases dynamic compliance. 26. A patient has the following measurements while receiving mechanical ventilation: exhaled VT = 480 mL, PIP = 45 cm H2O, plateau pressure = 30 cm H2O, PEEP = 8 cm H2O. What is the calculated static compliance? Is it normal based on the pulmonary measurement criteria for weaning? 28. Patients who fail an SBT often exhibit the following objective clinical signs: tachypnea, ____, hypertension, hypotension, hypoxemia or acidosis, arrhythmias. 29. Termination criteria for weaning from mechanical ventilation includes a ____. 30. Sometimes SIMV and ____ are used together in patients who have failed the spontaneous breathing trial. 31. In ____, the pressure support level is adjusted automatically to achieve the target tidal volume. 32. For a successful weaning outcome, the patient should have a ____. 33. A patient is being mechanically ventilated at an FiO2 of 100%. As a precautionary measure, you would monitor and limit its use to ___________ as lung damage can occur with prolonged exposure. 34. For adult patients during HFOV, the power is initially set at _____ and rapidly increased to achieve chest wiggle. Chest wiggle is defined as visible vibration from __________________. 36. An intubated patient is being treated with a broad-spectrum antibiotic. The physician would like to do a C&S sputum test. Since the patient’s cough is not strong enough to expectorate the retained secretions, you would collect the sputum sample in a _________________. 37. Alveolar hyperventilation is usually accompanied by a PaCO2 reading of _____________ and this may be managed by ________________ the mechanical VT or RR. 38. Upon entering Mr. Pendleton’s room you notice that the high-pressure alarm has been triggered since your last visit. It is no longer alarming. You should consider which of the following as the most likely cause? 39. You are reviewing the chart of a patient who has been admitted to the ICU for severe malnutrition and dehydration. Which of the following urine output measurements may be used to determine if the patient has a fluid deficit? 43. Among the conditions below, auto-PEEP is most likely caused by _______________ while on the ventilator. 45. The initial frequency during HFOV is set at _______ Hz and may be ___________ if using amplitude alone fails to control the PaCO2. 47. In HFOV, the mean airway pressure (mPaw) is affected by the ___________ and the initial mPaw should start at __________ the mPaw obtained during conventional mechanical ventilation. 50. Mr. Jones, a patient who has been mechanically ventilated for 3 weeks, is now on a high-calorie diet. Which of the following can be a potential problem associated with overfeeding during mechanical ventilation? 56. In high frequency oscillatory ventilation (HFOV), hypoventilation may be managed by ___________ the amplitude or by ____________ frequency. 57. In patients with normal cardiopulmonary status, increasing the ________ is the treatment of choice in improving the patient’s oxygenation. 58. In mechanical ventilation, the most common approach to improving minute ventilation is to increase the _________________. However it should not exceed __________ as auto-PEEP may occur. 60. An order has been written for initiating MV at a VT setting of 3 mL/kg. You would contact the physician and explain to her that the VT setting would be too _________ and it may lead to _______________. 61. You are reviewing ABG results of a 30-year-old, postoperative patient who has been on assist/control (a/c) ventilation and is currently awake and breathing spontaneously. The results are as follows: pH = 7.53, PaCO2 = 30 mm Hg, PaO2 = 102 mm Hg, HCO3 = 24 mEq/L, a/c rate = 12/min, total rate = 18/min, tidal volume = 800 ml, FiO2 = 30%. Based on the information provided, you would make which of the following changes to the ventilator setting? 62. In humans, water makes up approximately _______ of the total body weight. 66. The ABG report of Mr. Orin, a patient on mechanical ventilation, is as follows: pH = 7.50, PaCO2 = 32 mm Hg, PaO2 = 83 mm Hg. The physician asks you to make appropriate changes to the settings on the ventilator. Which of the following controls would have the least impact in correcting the patient’s condition as indicated by the ABG results? 67. The total rate of a mechanically ventilated patient is 10/min. At this rate, the ABG reveals a PaCO2 of 60 mm Hg. Assuming the VT and deadspace remain constant, calculate the RR necessary to achieve a PaCO2 of 40 mm Hg. A. Increasing the tidal volume is the most common approach to improving minute ventilation. B. Tidal volume should be set according to the patient’s ideal body weight. C. Increasing the tidal volume should be considered when the patient’s ventilatory rate exceeds an ideal breathing pattern. D. Insufficient tidal volume increases the risk of atelectasis and hypercapnia. 70. The following electrolytes are collected from a patient with severe sepsis who has been on a mechanical ventilator for two weeks. Which of the following electrolytes is out of its normal range? 72. The major cation in the extracellular fluid compartment is __________ and it plays an important role in ____________ balance. 73. Low VT strategy is done to reduce the risk of ______________ and the target volume is reached when _________________. 74. The PaCO2 of Ms. Hart, a 40-year-old mechanically ventilated dependent patient with normal cardiopulmonary status, is 60 mm Hg. This value indicates _____________ and should be managed by ______________ the mechanical VT or RR. 76. The pressure required to maintain alveolar inflation is known as which of the following? 77. The term used to describe the tendency of a structure to return to its original form after being stretched or acted on by an outside force is which of the following? 78. The condition that causes pulmonary compliance to increase is which of the following? 79. Use this figure to compute the static compliance (CS) for an intubated patient with an exhaled tidal volume (VT) of 500 mL. 80. The ventilator that functions most physiologically uses which of the following? 81. Plateau pressure (Pplateau) is measured during which phase of the ventilatory cycle? 82. Calculate airway resistance (Raw) for a ventilator patient, in cm H2O/L/sec, with the following information: Peak inspiratory pressure (PIP) is 20 cm H2O, plateau pressure (Pplateau) is 15 cm H2O, PEEP is 5 cm H2O, and set flow rate is 50 L/min. 83. Calculate the static compliance (CS), in mL/cm H2O, when PIP is 47 cm H2O, plateau pressure (Pplateau) is 27 cm H2O, baseline pressure is 10 cm H2O, and exhaled tidal volume (VT) is 725 mL. 84. Air accidentally trapped in the lungs due to mechanical ventilation is known as which of the following? 86. The respiratory therapist enters modes and parameters into the ventilator with which of the following? 87. The function of the exhalation valve is to do which of the following? 88. In the image, what does “B” represent? 90. Closed-loop ventilator logic systems are called “unintelligent” because they cannot be programmed to respond to changing conditions. 91. Modern ICU ventilators use flow control valves. These valves control or direct gas flow by opening or closing either completely or in small increments. 94. The equation of motion describes the relationships between which of the following? 95. How many variables can a ventilator control at one time? 96. An increase in airway resistance during volume-controlled ventilation will have which of the following effects? 97. An increase in airway resistance during pressure-targeted ventilation will have which of the following effects? 99. A patient who has been sedated and paralyzed by medication is being controlled by the ventilator. The set rate is 15 bpm. How many seconds does it take for inspiration and expiration to occur? 100. The trigger variable in the controlled mode is which of the following? 101. The inspiratory and expiratory flow sensors are reading a base flow of 5 liters per minute (L/min). The flow trigger is set to 2 L/min. The expiratory flow sensor must read what flow to trigger inspiration? 102. The patient trigger that requires the least amount of work of breathing for the patient is which of the following? 103. The limit variable set on a mechanical ventilator will do which of the following? 104. The variable that a ventilator uses to end inspiration is known as which of the following? 105. The most common method of terminating inspiration during pressure support ventilation is which of the following? 107. Which maneuver will maintain air in the lungs at the end of inspiration, before the exhalation valve opens? 108. A ventilator is set to deliver a 600 mL tidal volume. The flow rate is set at 40 L/min and the frequency is set at 10 breaths/min. If the flow rate is doubled and the patient is not assisting, which of the following will occur? A. The frequency will decrease. B. The tidal volume will increase. C. The expiratory time will increase. D. The inspiratory time will increase. 109. A patient with an opiate drug overdose is unconscious and has the following arterial blood gas results on room air: pH 7.20; partial pressure of carbon dioxide (PaCO2) 88 mm Hg; partial pressure of oxygen (PaO2) 42 mm Hg; bicarbonate (HCO3-) 25 mEq/L. Which of the following best describes this patient’s condition? 112. A 46-year-old male presents to the emergency department with a chief complaint of shortness of breath. Physical assessment reveals: pulse 102, blood pressure 138/80, respiratory rate 25 with accessory muscle use, and breath sounds are decreased with bilateral inspiratory and expiratory wheezing with a prolonged expiratory phase. The peak expiratory flow rate is 100 L/min. The immediate action by the respiratory therapist should include which of the following? A. Intubate and mechanically ventilate. B. Administer oxygen via non-rebreather mask. C. Administer continuous bronchodilator therapy. D. Initiate noninvasive positive pressure ventilation. 113. Which of the following patients is showing the signs of acute respiratory distress? 114. The underlying physiological process leading to pure hypercapnic respiratory failure is which of the following? 115. Which of the following are conditions affecting the central nervous system that is associated with a reduced drive to breathe? 116. A patient has recently been diagnosed with obstructive sleep apnea. The most appropriate treatment includes which of the following? 117. Which of the following is the minimum ventilator rate that is considered full ventilatory support? 119. Of the following breath descriptions, which one is considered spontaneous? 120. What type of breath occurs when the ventilator controls the timing, tidal volume, or inspiratory pressure? 121. An assisted breath in PC-CMV mode can be described by which of the following? 122. Full ventilatory support is provided by which of the following modes? 123. When a patient does not breathe spontaneously while in the airway pressure release ventilation (APRV) mode, the pressure-time scalar looks like that of which of the following? 124. A breath that is patient triggered, pressure targeted, and time cycled is which of the following? 125. A patient triggered, pressure limited, flow cycled breath describes which of the following? 126. The ventilator mode that delivers pressure breaths that are patient- or time-triggered, volume targeted, time cycled, and where the pressure is automatically adjusted to maintain delivery of the targeted volume is which of the following? 127. If the tube does not have a vocal cord marking, a rule to estimate the depth of intubation is to add the number ____ to the body weight in kilograms (kg). 128. Which of the following has a suggested starting ventilation of 20 to 30 cm H2O under low compliance conditions? A. Has a gestational age of more than 34 weeks. B. Has been mechanically ventilated for more than 2 weeks. D. Weighs less than 2,000 g.
B. Collection of tracheal specimens. A. Apgar score greater than 8. B. Difficulty ventilating by bag and mask. C. Meconium staining of amniotic fluid. D. Presence of diaphragmatic hernia. 133. The ability of HFOV to oxygenate the blood is not as good as with other methods. 134. Which of the following is not a primary function of mechanical ventilation? B. Difficulty to wean from conventional ventilation. D. Rapidly increasing FiO2 requirement. 136. For neonates below 1,000 g body weight, the proper size laryngoscope blade should be size _______ and ETT size _____ (internal diameter, mm). 137. Because of the potential risks associated with ECMO, the clinical criteria used selects only those infants who are at an 80% or greater risk of mortality if conventional methods are used. 138. Patients with ____ are excluded from consideration of ECMO. 139. Ideally, the temperature of the gas at the ____ should be 37 °C with a water content of 44 mg/L. 140. Which of the following is not a purpose of a conventional ventilator when used in tandem with HFJV? A. It provides a continuous gas flow for entrainment by HFJV. B. It provides pressure support ventilation. C. Its sigh breaths prevent microatelectasis. D. Its sigh breaths stimulate the production of surfactant. 141. Neonatal ventilator circuits should have a high compression factor. 142. Early studies involving ____ showed that adequate ventilation occurred even when tidal volumes far below deadspace were used. A. After conventional ventilation has failed. B. For premies with RDS. C. In tandem with conventional mechanical ventilation. D. To provide intrapulmonary percussion. 144. During mechanical ventilation, some of the ventilator volume is “lost” within the circuit and humidifier and is not delivered to the patient. This wasted volume is called the ____. 145. A(n) ____ of 35 to 50 mm Hg for 2 to 12 hours indicates a need for ECMO therapy. 146. Approximately 90% of surfactant is phospholipids, with ____ comprising 85% of the total amount. 147. High frequency ventilation has the advantage of delivering ___________ and reducing the incidence of ______________. 148. Which of the following statements is true concerning the venovenous route in ECMO therapy? A. Blood is removed from the right atrium via the right carotid artery. B. Blood is removed from the right atrium via the femoral vein. C. Blood is returned to the aortic arch via the internal jugular vein. D. Blood is returned to the right atrium via the femoral vein. 150. Which of the following statements is true concerning the venoarterial route in ECMO therapy? A. Blood is removed from the brachial or femoral artery. B. Blood is removed from the right common carotid artery. D. Blood is returned to the aortic arch via the right common carotid artery. A. At the ETT adapter. B. Inside the expiratory tubing. D. Outside the inlet to the incubator. A. ETT administration of epinephrine or surfactant is indicated. C. Premature rupture of amniotic membrane. D. Presence of thick meconium on delivery. 154. Selection of an ETT for neonates is based on the ____ or gestational age of the neonate. 155. Recent publications have reported that N-CPAP is both feasible and effective in most very-low-birth-weight infants and those with acute respiratory failure. 156. Since the tidal volume (VT) control is not available when using pressure-controlled ventilation, an estimated VT can be calculated by multiplying the inspiratory time (I time) and ____. 157. During ____________ controlled ventilation, the ventilator delivers a variable _____________ depending on a patient’s lung compliance or airflow resistance. A. Ground glass appearance on chest x-ray. 159. During pressure-controlled ventilation, a lower tidal volume would result when the patient’s compliance is __________ or airflow resistance is ______________. 160. A unique feature of the HFOV is that it produces extremely rapid ____________________ cycles. 161. An infant has the following measurements: mean airway pressure = 25 cm H2O, PaO2 = 45 mm Hg at an FiO2 of 60%. What is the calculated oxygen index (OI)? B. Gestational age at or less than 26 weeks. C. PaO2/PAO2 less than 0.22. 163. ____ has potential applications for use in several diseases that traditionally have been difficult to treat such as RDS, aspiration syndromes, persistent pulmonary hypertension of the newborn, and pneumonia. 165. A randomized trial comparing two surfactants, those obtained from mammalian lungs and those that are synthetically produced, found an advantage in using synthetic surfactant. 167. A neonate is being ventilated by HFOV. Her physician would like to lower the patient’s PaCO2. The therapist should increase the level of ventilation by ___________________ or ____________________. 169. Which of the following common surfactants has a recommended dosage of 4 mL/kg every 6 hours up to 4 total doses in the first 48 hours? 171. HFPPV is delivered at frequencies between ____ cycles per minute. 172. CPAP reduces V/Q mismatch by improving ____ and reducing intrapulmonary shunting. 173. The indications for using ____ include severe pulmonary disease that is complicated by air leaks, such as pulmonary interstitial emphysema (PIE), pulmonary hypoplasia, restrictive lung disease, and persistent pulmonary hypertension. So there you have it! I sincerely hope that this Mechanical Ventilation final exam study guide was helpful for you. I’m confident in the fact that if you go through the practice questions again and again, it will absolutely boost your knowledge of Mechanical Ventilators to the next level. If you put in the hard work now by learning this information, your future self will thank you because this important knowledge will help you pass your board exams and become the best Respiratory Therapist that you can possibly be! Thanks for reading, good luck, and as always, breathe easy my friend. 🔒 And don’t forget, if you need the answers to these Mechanical Ventilation practice questions, you can get them for free by Clicking Here.